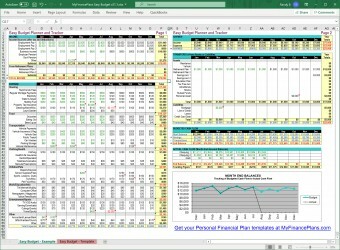 Basic functionality for learning and simple finances. Balanced - Includes the most needed features and is easy to use. For those that require the most features and flexibility. 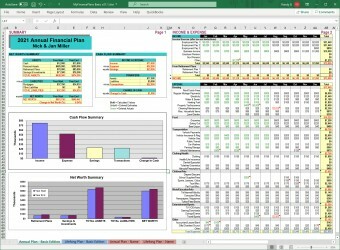 MyFinancePlans are easy to use spreadsheet templates for personal financial planning. With MyFinancePlans personal financial plan templates you can easily plan and track your income, expenses, savings, assets, liabilities, net worth and wealth for the current year and year-over-year for life. MyFinancePlans uses a spreadsheet approach allowing you maximum flexibility to realistically and accurately accommodate your individual situation. No other approach can provide the flexibility and ease of use that MyFinancePlans does. The Basic Edition is the easiest, the Lite Edition more detailed, and the Full Edition the most comprehensive. 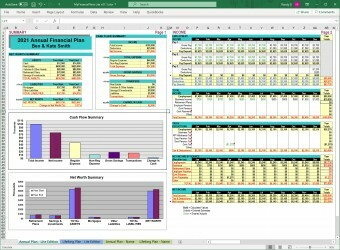 Also, a great Personal (or Family or Household) Budget template is available for free if that is all you need right now. MyFinancePlans Personal Financial Plans include an Annual Plan and a Lifelong Plan. The Annual Plan template enables you to accurately plan and track your annual finances giving you a clear view of your monthly income, expense, assets, liability, investments, cash flow and net worth. The Lifelong Plan template enables you to realistically plan your personal finances on a year-over-year basis for life. It is perfect for planning for retirement or career changes or other life scenarios. The simplest of life plans to the most complex scenarios involving a variety of life events and financial impacts can be accommodated with ease. In addition each plan edition comes complete with a User Guide and Example Plans. Take control of your finances at any stage of life - young and single, newly weds, a busy family, growing wealth, preparing for retirement, enjoying retirement, etc. With MyFinancePlans templates you can have your first realistic financial plans prepared within a few hours and be well on your way to understanding and controlling your finances. And with MyFinancePlans templates you can easily develop and compare different "what if" scenarios to help make important financial and life changing decisions. MyFinancePlans templates are very inexpensive (almost free) and pay for themselves many times over. Get your copy today and start planning and managing your finances.